Abu Ahmed was an essential member of the earliest incarnation of the group. He had been galvanised into militancy as a young man by an American occupation that he and many like him believed was trying to impose a power shift in Iraq, favouring the country’s larger Shia population at the expense of the dominant Sunnis. His early role in what would become Isis led naturally to the senior position he now occupies within a revitalised insurgency that has spilled across the border into Syria. Most of his colleagues regard the crumbling order in the region as a fulfilment of their ambitions in Iraq – which had remained unfinished business, until the war in Syria gave them a new arena. He agreed to speak publicly after more than two years of discussions, over the course of which he revealed his own past as one of Iraq’s most formidable and connected militants – and shared his deepening worry about Isis and its vision for the region. With Iraq and Syria ablaze, and the Middle East apparently condemned to another generation of upheaval and bloodshed at the hands of his fellow ideologues, Abu Ahmed is having second thoughts. The brutality of Isis is increasingly at odds with his own views, which have mellowed with age as he has come to believe that the teachings of the Qur’an can be interpreted and not read literally. His misgivings about what the Islamic State has become led him to speak to the Guardian in a series of expansive conversations, which offer unique insight into its enigmatic leader and the nascent days of the terror group – stretching from 2004, when he met Abu Bakr al-Baghdadi in Camp Bucca, to 2011, when the Iraqi insurgency crossed the border into Syria. Baghdadi was born Ibrahim ibn Awwad al-Badri al-Samarrai in 1971, in the Iraqi city of Samarra. He was detained by US forces in Falluja, west of Baghdad, in February 2004, months after he had helped found a militant group, Jeish Ahl al-Sunnah al-Jamaah, which had taken root in the restive Sunni communities around his home city. When Baghdadi, aged 33, arrived at Bucca, the Sunni-led anti-US insurgency was gathering steam across central and western Iraq. An invasion that had been sold as a war of liberation had become a grinding occupation. Iraq’s Sunnis, disenfranchised by the overthrow of their patron, Saddam Hussein, were taking the fight to US forces – and starting to turn their guns towards the beneficiaries of Hussein’s overthrow, the country’s majority Shia population. The small militant group that Baghdadi headed was one of dozens that sprouted from a broad Sunni revolt – many of which would soon come together under the flag of al-Qaida in Iraq, and then the Islamic State of Iraq. These were the precursors to the juggernaut now known simply as the Islamic State, which has, under Bagdhadi’s command, overrun much of the west and centre of the country and eastern Syria, and drawn the US military back to a deeply destabilised region less than three years after it left vowing never to return. But at the time of his stay at Bucca, Baghdadi’s group was little-known, and he was a far less significant figure than the insurgency’s notional leader, the merciless Abu Musab al-Zarqawi, who came to represent the sum of all fears for many in Iraq, Europe and the US. Baghdadi, however, had a unique way to distinguish himself from the other aspiring leaders inside Bucca and outside on Iraq’s savage streets: a pedigree that allowed him to claim direct lineage to the Prophet Muhammad. He had also obtained a PhD in Islamic studies from the Islamic University of Baghdad, and would draw on both to legitimise his unprecedented claim to anoint himself caliph of the Islamic world in July 2014, which realised a sense of destiny evident in the prison yard a decade earlier. According to Hisham al-Hashimi, the Baghdad-based analyst, the Iraqi government estimates that 17 of the 25 most important Islamic State leaders running the war in Iraq and Syria spent time in US prisons between 2004 and 2011. 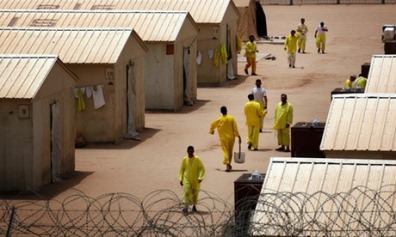 Some were transferred from American custody to Iraqi prisons, where a series of jailbreaks in the last several years allowed many senior leaders to escape and rejoin the insurgent ranks. Abu Ghraib was the scene of the biggest – and most damaging – breakout in 2013, with up to 500 inmates, many of them senior jihadists handed over by the departing US military, fleeing in July of that year after the prison was stormed by Islamic State forces, who launched a simultaneous, and equally successful, raid on nearby Taji prison. Iraq’s government closed Abu Ghraib in April 2014 and it now stands empty, 15 miles from Baghdad’s western outskirts, near the frontline between Isis and Iraq’s security forces, who seem perennially under-prepared as they stare into the heat haze shimmering over the highway that leads towards the badlands of Falluja and Ramadi. The revelation of abuses at Abu Ghraib had a radicalising effect on many Iraqis, who saw the purported civility of American occupation as little improvement on the tyranny of Saddam. While Bucca had few abuse complaints prior to its closure in 2009, it was seen by Iraqis as a potent symbol of an unjust policy, which swept up husbands, fathers, and sons – some of them non-combatants – in regular neighbourhood raids, and sent them away to prison for months or years. At the time, the US military countered that its detention operations were valid, and that similar practices had been deployed by other forces against insurgencies – such as the British in Northern Ireland, the Israelis in Gaza and the West Bank, and the Syrian and Egyptian regimes. Death squads were by then roaming Baghdad and much of central Iraq, killing members of opposite sects with routine savagery and exiling residents from neighbourhoods they dominated. The capital had quickly become a very different place to the city Abu Ahmed had left a year earlier. But with the help of new arrivals at Bucca, those inside the prison had been able to monitor every new development in the unfolding sectarian war. Abu Ahmed knew the environment he was returning to. And his camp commanders had plans for him. Zarqawi wanted a 9/11 moment to escalate the conflict – something that would take the fight to the heart of the enemy, Abu Ahmed recalled. In Iraq, that meant one of two targets – a seat of Shia power or, even better, a defining religious symbol. In February 2006, and again two months later, Zarqawi’s bombers destroyed the Imam al-Askari shrine in Samarra, north of Baghdad. The sectarian war was fully ignited and Zarqawi’s ambitions realised. He then reflected on the man who gave the orders. “Zarqawi was very smart. He was the best strategist that the Islamic State has had. Abu Omar [al-Baghdadi] was ruthless,” Abu Ahmed said, referring to Zarqawi’s successor, who was killed in a US-led raid in April 2010. “And Abu Bakr is the most bloodthirsty of all. Despite reservations that were already starting to stir, by 2006, Abu Ahmed had become part of a killing machine that would operate at full speed for much of the following two years. Millions of citizens were displaced, neighbourhoods were cleansed along sectarian lines, and an entire population numbed by unchecked brutality. That summer, the US finally caught up with Zarqawi, with the help of Jordanian intelligence, killing him in an airstrike north of Baghdad. From late 2006, the organisation was on the back foot – hampered by a tribal revolt that uprooted its leadership from Anbar and shrank its presence elsewhere in Iraq. But according to Abu Ahmed, the group used the opportunity to evolve, revealing a pragmatism in addition to its hardline ideology. For Isis, the relatively quiet years between 2008 and 2011 represented a lull, not a defeat. By this time, Abu Bakr al-Baghdadi had risen steadily through the group to become a trusted aide to its leader, Abu Omar al-Baghdadi, and his deputy, the Egyptian jihadist Abu Ayub al-Masri. It was at this point, Abu Ahmed said, that Isis made an approach to the Ba’athist remnants of the old regime – ideological opponents who shared a common enemy in the US and the Shia-led government it backed. From 2008, when the US began to negotiate the transition of its powers to Iraq’s feeble security institutions – and therefore pave the way to its own exit – the Americans increasingly turned to only a few trusted figures in the Iraqi government. One of them was Major General Hussein Ali Kamal, the director of intelligence in the country’s Interior Ministry. A secular Kurd who had the trust of the Shia establishment, one of Kamal’s many duties was to secure Baghdad against terror attacks. Like the Americans, General Kamal was convinced that Syria was destabilising Iraq, an assessment based on the interrogations of jihadists who had been captured by his troops. Throughout 2009, in a series of interviews, Kamal laid out his evidence, using maps that plotted the routes used by jihadists to cross the border into western Iraq, and confessions that linked their journeys to specific mid-ranking officers in Syrian military intelligence. When I first met him in 2009, he was poring over transcripts of recordings that had been made at two secret meetings in Zabadani, near Damascus, in the spring of that year. The attendees included senior Iraqi Ba’athists who had taken refuge in Damascus since their patron Saddam was ousted, Syrian military intelligence officers, and senior figures in what was then known as al-Qaida in Iraq. The Syrians had developed links to the jihadists since the earliest days of the anti-US insurgency and had used them to unsettle the Americans and their plans for Iraq. The Ba’athists present led the meeting. Their aim, according to General Kamal’s source, was to launch a series of spectacular attacks in Baghdad and thereby undermine Maliki’s Shia-majority government, which had for the first time begun to assert some order in post-civil war Iraq. Until then, al-Qaida in Iraq and the Ba’athists had been fierce ideological enemies, but the rising power of the Shias – and their backers in Iran – brought them together to plan a major strike on the capital. By July 2009, the Interior Ministry had increased security at all checkpoints across the Tigris river into Baghdad, making a commute at any time of day even more insufferable than normal. And then General Kamal received a message from his source in Syria. The extra security at the bridges had been spotted by the attack plotters, he said. New targets were being chosen, but he didn’t know what they were, or when they would be hit. For the next two weeks, Kamal worked well into the evening in his fortified office in the southern suburb of Arasat, before being sped by armoured convoy across the July 14 Bridge – which had been a target only days earlier – to his home inside the Green Zone. On the morning of 19 August, the first of three flat-bed trucks carrying three large 1000-litre water tanks, each filled with explosives, detonated on an overpass outside the Finance Ministry in south-eastern Baghdad. The blast sent a rumble across the Emerald City, raising desert soil that caked homes brown, and sending thousands of pigeons scattering through the sky. Three minutes later, a second enormous bomb blew up outside the Foreign Ministry on the northern edge of the Green Zone. Shortly after that, a third blast hit a police convoy near the Finance Ministry. More than 101 people were killed and nearly 600 wounded; it was one of the deadliest attacks in the six-year-old Iraqi insurgency. “I failed,” Kamal told me that day. “We all failed.” Within hours, he was summoned to meet Maliki and his security chiefs. The prime minister was livid. “He told me to present what I had to the Syrians,” Kamal later said. “We arranged with Turkey to act as a mediator and I flew to Ankara to meet with them. I took this file” – he tapped a thick white folder on his desk – “and they could not argue with what we showed them. The case was completely solid and the Syrians knew it. Ali Mamlouk [the head of Syrian general security] was there. All he did was look at me smiling and say ‘I will not recognise any official from a country that is under US occupation’. It was a waste of time.” Iraq recalled its ambassador to Damascus, and Syria ordered its envoy to Baghdad home in retaliation. Throughout the rest of the year, and into early 2010, relations between Maliki and Assad remained toxic. In March 2010, Iraqi forces, acting on a US tip, arrested an Islamic State leader named Munaf Abdul Rahim al-Rawi, who was revealed to be one of the group’s main commanders in Baghdad, and one of the very few people who had access to the group’s then leader, Abu Omar al-Baghdadi. Al-Rawi talked. And in a rare moment of collaboration, Iraq’s three main intelligence bodies, including General Kamal’s Intelligence Division, conspired to get a listening device and GPS location tracker in a flower box delivered to Abu Omar’s hideout. After it was confirmed that Abu Omar and his deputy, Abu Ayub al-Masri, were present at a house six miles south-west of Tikrit, it was attacked in a US-led raid. Both men detonated suicide vests to avoid being captured. Messages to Osama bin Laden and Ayman al-Zawahiri were found on a computer inside the house. Much like Bin Laden’s safe house in Pakistan, where he would be killed a little more than a year later, Abu Omar’s hideout had no internet connections or telephone lines – all important messages were carried in and out by only three men. One of them was Abu Bakr al-Baghdadi. The deaths of Abu Omar al-Baghdadi and Abu Ayub al-Masri were a serious blow to Isis, but the roles they had vacated were quickly filled by the alumni of Camp Bucca – whose upper echelons had begun preparing for this moment since their time behind the wire of their jail in southern Iraq. “For us it was an academy,” Abu Ahmed said, “but for them” – the senior leaders – “it was a management school. There wasn’t a void at all, because so many people had been mentored in prison. Life with Isis means power, money, wives and status – all attractive lures for young firebrands with a cause - but it also means killing and dominating for a worldview in which he no longer believes so fervently. He said hundreds of young men like him, who were drawn to a Sunni jihad after the US invasion, do not believe that the latest manifestation of the decade-long war remains true to its origins.